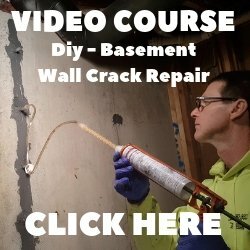 How to test for moisture in a concrete floor or slab. Doing a concrete moisture test before you install any type of flooring over a concrete floor or slab is important because too much moisture vapor transmission (MVT) can delaminate flooring materials like epoxy, linoleum, laminate tile, can buckle wood floors, and can cause mildew in carpeting. start causing problems. Testing for this moisture vapor transmission rate is relatively easy and can be done by yourself or you can hire someone. but make sure they are sealed really good to the concrete. Leave the plastic taped to the concrete overnight (16 hrs), if there is moisture under the plastic when you peel it off or if the concrete is darker in color, you have moisture in your concrete and it's too wet to install an impermeable flooring material over it. Calcium chloride tests have been around since the 1960's. 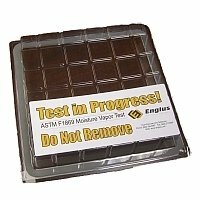 These concrete moisture test kits are readily available on the internet from suppliers like Amazon (see below). To test, you simply place a pre-weighed dish of calcium chloride on your concrete floor, then cover and seal it with the plastic dome they supply. Moisture from the concrete floor is absorbed by the calcium chloride when it exits the surface. After 72 hours the test dish can be collected and weighed, the increase in weight is how you determine how much moisture in in the concrete. The increased weight is calculated using an equation and this gives you the moisture vapor emission rate (MVER) of your concrete floor. The MVER is how much water is emitted from the concrete floor in 24 hours per 1000 square feet of floor. 3lbs per 1000 sq. ft. is a common maximum MVER of many flooring materials. To conduct this test you will need a GRAM WEIGHT SCALE with a gradiation of 1/10 (0.1) gram. The calcium chloride container is weighed before and after you set it on the concrete floor. It is not recommended you do the concrete moisture test unless the building environment (relative humidity) is the same as the working environment will be. More or less humid conditions in the building can give you false readings that could lead to problems later on. 1. Clean the concrete using a wire brush, floor grinder, or shotblaster. 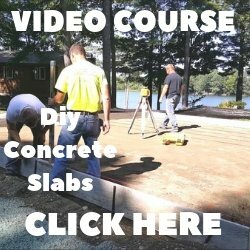 There must be no oil, dirt, glue, or mastic on the surface of the concrete. Use the formula below to calculate the Moisture Vapor Emission Rate MVER of the concrete floor. The result is expressed as "pounds", which is the equivalant weight of water, emitted as vapor, over 1000 square feet of floor area in 24 hours time. You can use this result to compare to Manufactures specifications for their floor coverings and coatings tolerances. Here is a worksheet to help you calculate the results. For full in-depth directions on how to perform a Relative Humidity test on concrete floors and slabs see: Performing RH testing in concrete floors and slabs or watch the video. You can purchase a RH test kit using the link below.